Mankind has long struggled to rise above his lowly circumstances and claw his way to the top of the food chain. All of this was made possible by his learning, his scientific inquiry, and, of course, his faith in the ancient Greek deities. In Deus our forefathers attempt to forge civilization through cunning, wisdom, and the acute application – and sacrifice – of cards. The object is to have the most victory points at the end of the game. Two to four players lead their civilizations into the next age with some divine assistance. Everyone is issued a player board and hand of five building cards, plus some money, resources, and victory points. 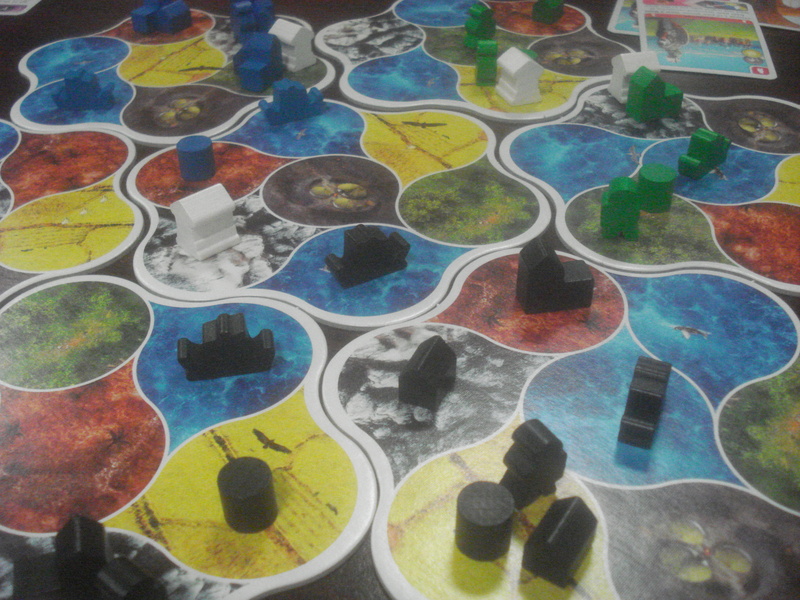 Along the player boards are colored spaces where wooden building pieces sit until built. The map in the middle of the table is a series of interlocking geomorphic tiles (“continents”) subdivided into smaller regions, and the regions show either a terrain type (sea, swamp, etc.) or a barbarian village. On his turn a player has a choice: Erect a building or pay tribute to the gods. 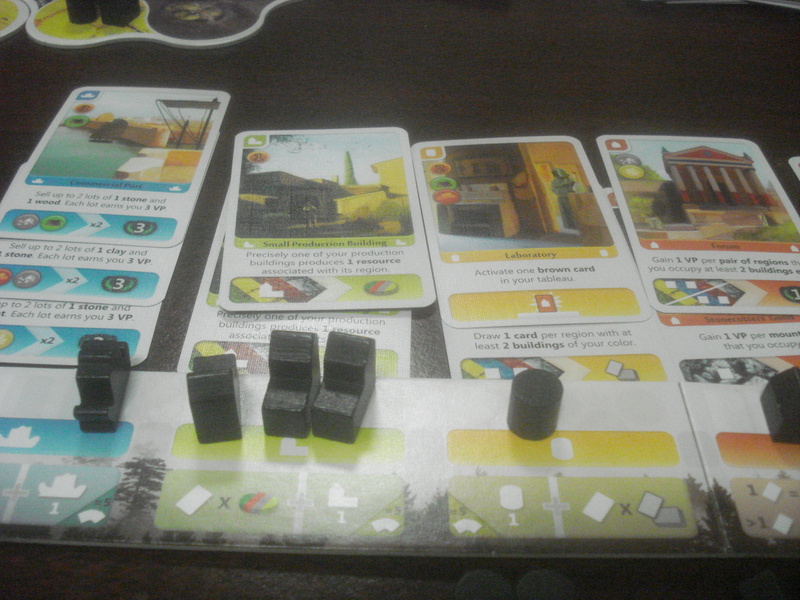 The cards show one of six kinds of buildings; the player chooses one, pays its construction cost in resources and money, places the appropriate wooden marker on the board, and receives the structure’s benefit. For example the card may offer more resources, let someone attack a neighbor, or score victory points for progress made thus far. The card then goes in a matching column on their player board – all maritime buildings are blue and so go in the blue column. All civilizations begin somewhere on the board’s edge and expand inward; new structures go in regions with or adjacent to that player’s previous builds unless a leader is willing to spend VP to start another settlement elsewhere. When someone puts multiples of a building type into play he layers the cards in that column so he can see the text. He not only gets the benefit written on the card just placed but those of all the ones he played before, oldest to newest. Standard buildings may produce resources based on their terrain; trade one commodity for another; supplant the powers of the gods and activate other buildings’ powers; and provide money and VPs. There are also military units – alternately called armies – built like structures but shaped like people. These can move about the board, which is necessary if one wishes to steal money and VPs from opponents or destroy barbarian villages. Finally temples, neutrally colored structures, can only be created alongside a player-color building. These are a big source of victory points at the end of the game if their various conditions are satisfied. A temple can go up at any time but a player’s second and subsequent temples can only rise every time a set of the five standard building types is completed. "Now serving building number four...now serving building number four"
Leaders may offer cards to the gods to receive money, resources, VPs, and/or a new hand of cards. It’s also the easiest way to earn new buildings to place (more than half the players’ supply of buildings isn’t in play at the outset). At least one card has to match the deity/color invoked, so Neptune demands a blue maritime building card and he’ll bestow a gold coin for every card discarded. He also grants a maritime building from the supply for construction. When all the barbarian villages are surrounded by buildings or all the temples are in play, the following round is the last one and the highest VP total wins. 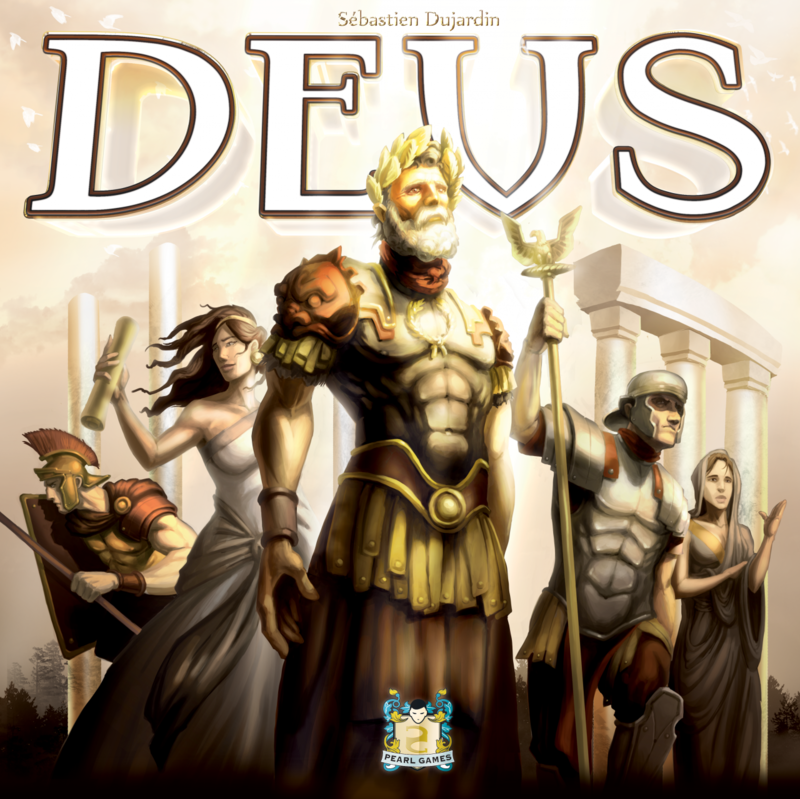 Deus has some nice components going for it. The player boards are foldouts (so they fit in the box), but getting them to open completely is something that only comes in time and with use. Oddly, the rulebook does not quite fit back into the box: It’s slightly larger in one dimension than its container. They treat the customer to plenty of wooden pawns and the punch-out counters are a good thickness with colorful designs. The map sections have curved edges that don’t fit together snugly but they’re pretty flush with the table making them stable enough to prevent terrible sliding disruptions during the game. The cards are nice and Asmodee sprung for some great-looking artwork – some duplications, yes, but all high-quality views. 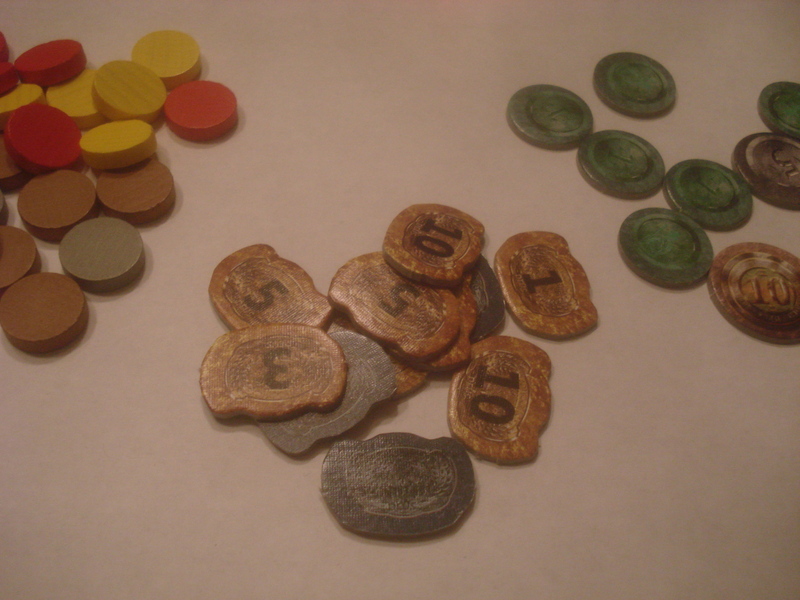 An oddity: The resource costs show lumber in green whereas those discs are brown; to be fair the forest regions (the source of wood) are green, but it’s still jarring to see two colors stand in for a single type of good. Maybe this eliminates confusion with the coin cost, which is a number against a copper background. The contrast could be for the benefit of the colorblind (the game’s hues are pastel shades, giving the whole thing an Easter Sunday sort of sheen), but all this still might leave everyone a bit puzzled until they get used to it. "Blessings! Blessings from the Lord!" "Gods be praised!" Deus bills itself, in part, as an addictive game and that plays out pretty accurately. Every time through it you’re left thinking, “Next time I’ll do X instead.” The rules aren’t varied or complex but the card effects are so there remain plenty of strategies to investigate. One is never left without options since he can always sacrifice to the gods, he just might not be able to talk to the specific deity he wants right now. Military prowess is downplayed in this system, which is nice, but there’s just enough exercise of martial power to keep everyone nervously on his toes. The right cards steal money or VPs from opponents and since powers reactivate with every new card in that column, others scramble to field armies of their own – the rules deftly activate an arms race in a game without combat mechanics. Most questions are dealt with in the rules, and the book clears the cobwebs from potentially tricky terminology debates; uncertain mechanics are made clear. Players know what counts as a “building” and whether barbarian villages are considered as such for various card effects. Sometimes the card wording is clunky – “Gain 1 building per region with at least 2 buildings of your color” would probably be better expressed as “For every region containing 2 of your colored buildings . . .” – but they produce everything with text and symbols for clarity. Some benefits are harder to obtain than others (how often does one have “up to six wood resources” to just fritter away for a card’s advantage? ), but while the economy isn’t as generous as players could want (when is it ever?) no one element of Deus is permitted to be the bane of the players’ existence. It’s fun, it’s replayable, and it comes in under an hour once you have the rules down. It might not be a godsend, but it has known the touch of a muse or two. in my back. Very unrealistic.